I truly like this sign for two reasons: first, if the taxpayers picked up the bill for this atrocity of excessive signage, then I'm not surprised. Second, why is the golfcart in a crosswalk? Are motorized vehicles allowed in crosswalks? 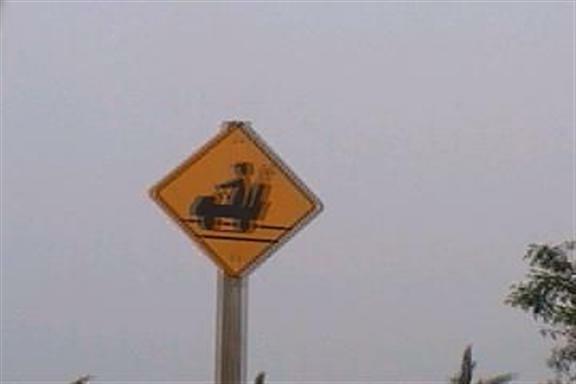 And also, while I'm talking about how ridiculous this sign is, who has the right of way when a golf cart goes to cross the road? Does the golf cart, in the crosswalk, have the right of way on their side of the roadway? I mean, they are in a crosswalk. And if they don't have the right of way, then why not just install a stop sign facing the golf cart drivers? If you're making the signs to warn the drivers, so why not warn the golfers instead and let them be liable for not taking the time to look both ways to cross?